We will be returning to take a stand at the Glasgow Contemporary Art Fair next month, which will take place at the world renowned Kelvingrove Art Gallery and Museum located in the city’s West End. The event, which is now in its fifth year, will take place from the 17th -19th May. 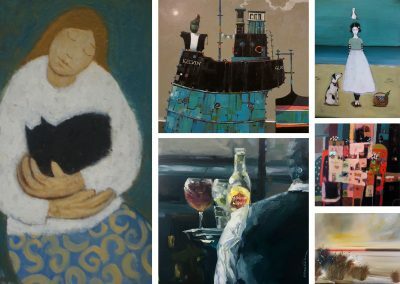 We will be on stand 13, and will be representing a range of artists including Rosanne Barr, Cecilia Cardiff, Andy Cross, Emma Davis RSW PAI, Marion Drummond PAI, James Fraser RSW, Jackie Henderson, Layla Rose, Mairi Stewart, Helen Tabor, Gordon Wilson & Georgie Young to name a few. We will also bring a selection of 3d work. The art fair will be held in a purpose built marquee located conveniently next to the venues main entrance. There will be on site parking, a Cafe (Saturday and Sunday), artist meet and greet and much more. We have a limited number of passes for the preview, as well as for the weekend, so please get in touch if you are interested in attending. It will be on a first-come-first-served basis.